Reaction to the 2-1 defeat at Maidstone, quotes from Eastleigh boss Ronnie Moore: “One or two think they’re better than they are and that’s got to change. “Everyone wants to beat us but we need to have the best team not just the best individual players. “We seem to think it’s going to be easy against the so-called lesser teams. “Too many think they can just turn up - they have to look in the mirror. “That was disappointing again - the goals we give away - the first one was unbelievable. “We get back in it and then give away a stupid pen. You can’t legislate for that. You do all the work with your back four in training and then we go and do that. “How we missed that chance at the end when Beano (Constable) put the ball past the post...you have to take your chances when they come but it’s not going for us in front of goal. “It’s back to the drawing board. We’ve got a lot to work on to get a play-off spot. Following on from Eastleigh's 3-0 home loss to Chester at the weekend, it was back-to-back defeats for the Spitfires as they were defeated 2-1 away at Maidstone on Tuesday evening. Ronnie Moore's side found themselves 1-0 down with just five minutes played as Dan Sweeney opened the scoring from close-range. A Mikael Mandron penalty early in the second half levelled things up at 1-1 for the Spitfires, before former Eastleigh forward Yemi Odubade won a penalty for the hosts. Bobby Joe-Taylor scored from the spot to restore Maidstone's lead. Next up for Eastleigh is the FA Cup 2nd round tie at Halifax. Eastleigh: Brown, Partington, N’Gala, Essam, Green, Stearn (Santos 75), Taylor, Drury, Coulson, Mandron (Constable 84), Cureton (Wilson 67). Subs not used: Pipe, Reason. Eastleigh will face Harlow Town away in the first round of the FA Trophy. The tie is scheduled to be played on Saturday, December 10. The winners will receive £5,000 in prize money and a place in the next round. Eastleigh get away tie in FA Trophy Eastleigh are away to Harlow Town in the first round of the FA Trophy. Moore: "We need a clinical finisher"
Quotes from Eastleigh boss Ronnie Moore following the 3-0 defeat at home to Chester. “We’ve shot ourselves in the foot. “For me that team (Chester) is there to be beaten. You’re not telling me they’re 3-0 better than we are, but we’ve killed ourselves today. “When you go 1-0 down you can’t go gung-ho, you’ve got to keep your shape. But we’ve had the two full-backs bombing on and the centre-backs going two for two and any counter-attack is going to cause you problems. “The first goal should never happen. Parts and Couls (were there), one of them goes to sleep and the lad goes clean through. 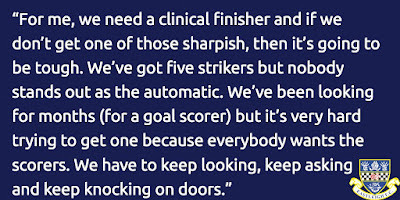 But we’ve had loads of opportunities like that to get the ball in the box and we’ve hit the first man how many times? “We’ve got strikers trying to walk the ball in instead of taking a snap-shot when it’s there. We’ve got to be more ruthless. “We’ve had 20-odd crosses into Chester’s box and never really tested their keeper. “They’d not been anywhere near our goal until they scored their first. 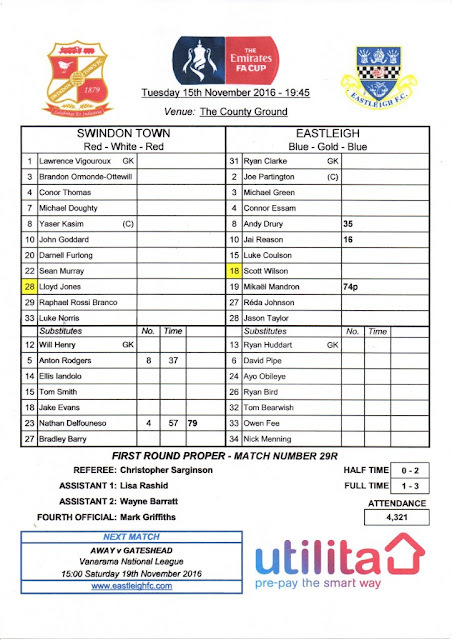 Eastleigh: Scott Brown, Joe Partington, Michael Green, Jason Taylor, Bodndz N’Gala, Reda Johnson, Luke Coulson, Andy Drury, Mikael Mandron, Scott Wilson (Jamie Cureton, 58), Ross Stearn (Alefe Santos, 69). Subs (not used) Connor Essam, James Constable, Jai Reason. Eastleigh's Vanarama National League home game against Forest Green Rovers has been given a new date. The Eastleigh v Forest Green fixture will now be played on Tuesday 10th January at 7.45pm. It was originally scheduled for Saturday 3rd December but has been re-arranged due to Eastleigh’s FA Cup fixture against FC Halifax Town. The 2nd Round FA Cup tie will take place at the Silverlake Stadium on Sunday 4th December with a 2pm kick off. Ronnie Moore comments on the signing of Bondz N'Gala and the prospect of Eastleigh's record signing playing alongside Reda Johnson in the heart of defence. “They’re both big and strong. Reda’s just a bit taller, but Bondz is broader. It is reported that the Spitfires spent £60,000 to capture the signature of N'Gala and Moore has praised chairman Stewart Donald for being allowed to make the signing. “The chairman has done well to allow him in. “If we want to get out of this league we’ve got to try and bring in better than we’ve already got and Bondz is in that category. He’s given up League football to come here. We need winners like him. Eastleigh sealed a much-needed three points with a 1-0 win at Aldershot in the Hampshire derby. Mikael Mandron scored his fifth goal in as many games as the Spitfires recorded a welcome clean sheet. New players Scott Brown, goalkeeper on loan from Wycombe, and record-signing centre-back Bondz Ngala, both played a valuable part in the shut-out for Ronnie Moore's side. Aldershot: Smith, Arnold, Conroy, Evans, Straker, Allen (Wakefield 73), Gallagher, Kellerman (Kanu 73), Mensah, Rendell, McClure (Walker 46). Subs not used: Saville, Alexander. Eastleigh: Brown, Partington, Essam, N’Gala, Green, Coulson, Reason, Taylor, Stearn (Santos 67), Wilson (Constable 86), Mandron. Subs not used: Pipe, Huddart, Cureton. Booked: Brown, Reason, Partington. Eastleigh have completed the signing of centre-back Bondz N’Gala for a club record transfer fee from League Two side Barnet on an 18-month contract. Bondz goes straight into the squad for this evenings fixture at Aldershot Town. The powerful 6’ 2” defender started his career at West Ham United and counts Portsmouth, Stevenage, Yeovil Town, Plymouth Argyle, Scunthorpe United, MK Dons and Weymouth amongst his former clubs. 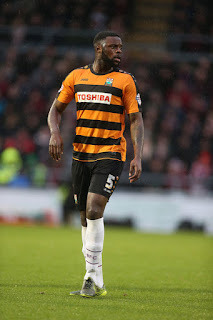 Bondz was also a regular in the Barnet side that won the Conference Premier (now National League) in 2014/15. The 27-year-old is approaching 250 career appearances. Eastleigh complete club record signing EASTLEIGH have today completed a club record signing of centre-back Bondz N'Gala from League Two side Barnet. Eastleigh loan League Two goalkeeper as injury list growsINJURY-HIT Eastleigh will have a new face between the sticks at Aldershot Town tomorrow night (7.45pm). The club have moved to loan goalkeeper Scott Brown from Wycombe Wanderers as they wait on the results of a scan on Ryan Clarke's elbow, damaged in a training session en route to Saturday's 2-2 draw at Gateshead. Moore: "We were so naive and so brittle"
Eastleigh surrendered a two-goal half-time lead to draw 2-2 away at Gateshead. The Spitfires opened the scoring through Scott Wilson in the 25th minute. It was Scott's first goal for the club and came on the back of a strong performance against Swindon in the FA Cup in midweek. Ronnie Moore's side doubled their advantage as the first half came to a close with a penalty from Mikael Mandron. Mandron has now scored in four consecutive games for Eastleigh. Gateshead fought back in the second half and scored twice to level the game through Sam Jones (72) and a Danny Johnson penalty (79) after Reda Johnson was penalised for a foul on Wes York. Ryan Huddart ensured Eastleigh at least came away with a point as he made a number of one-on-one saves as the hosts pushed for a late winner. Focus returns to league as FA Cup is "put in a cupboard"
Eastleigh boss Moore: Let's put the FA Cup in the cupboard and concentrate on the league!BOSS Ronnie Moore wants Eastleigh's heroes to lock their FA Cup excitement away and channel all their energy into Saturday's huge Vanarama National League test at Gateshead. The Spitfires pulled off the greatest result in their history on Tuesday, humbling League One Swindon Town 3-1 at the County Ground, writes Wendy Gee. Last season the Spitfires were the last non-league side standing in England’s most prestigious cup competition. This time round, Eastleigh are at it again taking their first big scalp of this season’s FA Cup campaign with a stunning 3-1 victory away at League One side Swindon Town. There is a gap of two leagues between the two clubs, but it was Ronnie Moore’s side who caused an upset on another memorable night for Eastleigh. Eleven coach load of supporters travelled up the A34 to back their side in their hundreds. The 788 fans were rewarded with a fine performance and a result that sent the Hampshire side through to the second round of the competition. Eastleigh season ticket holder Lee Stevens is dreaming of going one step further than the 2015/2016 season’s feat of reaching the third round. “We’re a non-league side, they’re League One and we haven’t just beaten them, we played them off the park. “It’s unbelievable when you consider they’re a League One club – and we could have won by more. “Alright, you can say they’re struggling, but they’re not in the bottom four any more. “To beat a League One team when you’re a National League team is fantastic for me – and fantastic for the team. “To totally dominate like we’ve done is remarkable. “The support was just unreal. What was it, just short of 1,000 people here? It’s great for them to come up and see how well we’ve played. “If we can believe in ourselves we’ve got a heck of a team here. I’ll still try to bring one or two in but it’s a fantastic night for Eastleigh FC. It was another memorable night for Eastleigh FC - the Spitfires defeated League One side Swindon Town by three goals to one to seal a place in the second round of the FA Cup. Eastleigh goals were scored by Jai Reason, Andy Drury and a Mikael Mandron penalty. Swindon Town: Vigouroux; Furlong, Rossi-Branco, Jones, Ormonde-Ottewill; Thomas (Delfouneso 57), Kasim (C); Murray, Doughty, Goddard; Norris. Subs unused : Henry, Barry, Smith, Rodgers, Iandolo, Young. Eastleigh: Ryan Clarke, Joe Partington, Connor Essam, Reda Johnson, Michael Green, Andy Drury, Jason Taylor, Jai Reason, Luke Coulson, Scott Wilson, Mikael Mandron. Subs unused: Ryan Huddart, David Pipe, Ayo Obileye, Ryan Bird, Tom Bearwish, Owen Fee, Nick Menning.